Amity University is one of the premier institutions in the country offering top-notch higher education courses through both regular and distance mode. The university is highly ranked among the best institutes in the country and is the only university in the country to be awarded the highest 9001:14001 quality award of AQSR of USA. Amity University DDE offers various courses through the distance education mode. The flagship distance education program offered by the university is its Distance MBA program. The course is designed in such a way to equip managerial knowledge and skills to students as well as working professionals. The program is offered over a course of 2 years. Amity University Distance MBA is offered in 14 Industry oriented specializations including HR, Finance, Entrepreneurship, International Business, Banking and more. The mode of learning is online through live lectures, video recorded sessions, study material and more. The last date to apply for the July Academic session is 20th September. 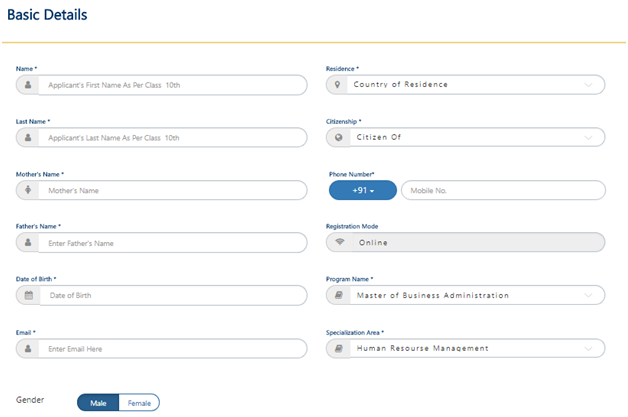 The applicant has to obtain the application form online from the official website of Amity Online University for Distance Learning. The form needs to be filled online and submitted there. Once the form is filled and submitted, the applicant will have to upload the documents online on to their website for verification. The candidate needs to download the application form from the official website. Then he/she needs to fill it and submit at any of the authorized centre/campus along with the required documents. Under this method, candidates need to visit authorized centre/campus and obtain the application form from the admission counter. Finally, the application fee of Rs 1100 needs to be paid. The Amity University Distance MBA fee is higher when compared to distance education institutes. The institute provides the option for “Payment per semester”. Though the lumpsum payment is cheaper than the per semester payment. The fee may be paid online using Credit/Debit cards, or the fee may also be paid through demand draft. Admission to Amity Distance MBA and PGDM program happens in 2 sessions. First session is conducted from January to April while second session is conducted from July to September. Although the university does not offer any specific scholarships to its students, the university offers fee concessions, to defense officers/JC Officers/Other ranks. The university also offers fee concessions to physically disabled students, and reserved category students. Though for the distance learning course it does not offer any scholarship or fee concession to the reserved category or PWD students. The student must have sufficient knowledge of English, and candidates whose first language is not English must have completed at least three years of higher education (Post Class 12th) in English. Amity University is approved by the AICTE and is accredited by the NAAC with an “A” grade. The university is recognized by the Ministry of HRD, Government of India, and is also listed among the International Association of Universities. Furthermore, Amity’s distance education branch i.e Amity University Online has all of its courses approved by the Distance Education council. Amity University is one of the topmost ranked universities in India and is constantly ranked in the top 10 universities in India for both its traditional courses and distance education courses. Amity School of Distance Learning has been ranked 1stamong the best distance learning universities. Times of India, and India Today survey have ranked Amity University the best university. Furthermore, DNA Indus Learning Survey 2012 and Business World rank the university 4th and 3rd respectively for distance education respectively. The university has a dedicated placement center called the Corporate Resource Center (CRC) at the University campus of ASoDL, where the students are given career advice, and placement assistance. The university has a large network of Study centre and Support & Information centers for contact classes and for admission and other facilities the university provides its students.